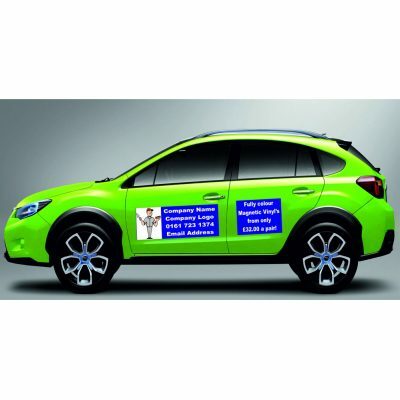 Use your car or van to advertise where ever you go, turn your drive into a marketing opportunity. Whether you’re a Estate Agent, Builder or Restaurant owner, you can make an impression with our thick magnetic car or van signs. And the matt finish and UV ink printing also provide higher-quality, fade-resistant images. • Turn personal vehicles into instant adverts, every time you drive, then simply take the signs off when you don’t want to advertise. • Clean your magnetic signs quickly and easily with mild soapy water. Our magnetic car or van signs can also be removed and refitted as often as you like. Our magnetic signs and are fully laminated, scratch proof and UV stable. We print your signs in full colour, you can have text, also logos or even images. The below prices are for a pair of signs, so you have 1 for each side of your car or van.